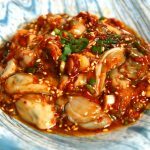 Korean Gulmuchim is a simple and easy recipe. Just mix some raw oysters with the seasonings and you’re done! It’s been one of my favorite side dishes ever since I was young. If you like freshly shucked oysters and Korean food, it will be a nice side dish for your rice! The only real problem is that freshly shucked oysters are kind of pricey. 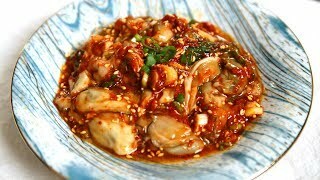 I sometimes make this dish with packaged frozen oysters sold at a Korean grocery store. Check out the photo below. The oysters are flash frozen, so it’s safe to eat them raw if you know how to thaw them out properly. Once I bring them home, I soak the unopened package in cold water to thaw them out. Then I open the package and put the oysters into salty water (about 3 cups water and 1 tablespoon salt), and then rinse them off one by one to remove any sediment. Then I rinse them a couple more times and strain. Then they’re ready to mix with seasonings. You can try it out. Gulmuchim is good with frozen oysters, but made with oysters freshly shucked right in front of you is much more refreshing and tastier. Combine oysters, garlic, green onion, soy sauce, hot pepper flakes, sugar, sesame oil, and sesame seeds in a bowl and mix well with a wooden spoon. Transfer to a plate and serve with rice. Posted on Tuesday, November 28th, 2017 at 7:25 pm. Last updated on February 24, 2018. Posted February 23rd, 2018 at 9:52 pm | Log in to reply. What a fantastic recipe, Maangchi! I am fortunate to live in Washington State on Puget Sound, where we have fantastic oysters One Note: In your Ingredients above, it looks like part of the information was cut off. I think you meant to say that it took about 2 dozen oysters, but it only says “About 2”. Maybe it meant about 2 cups? Keep these wonderful recipes coming! When is you next book coming out??? Posted February 24th, 2018 at 12:36 am | Log in to reply. Thank you for letting me know! I updated it. Good luck with making delicious gulmuchim! Posted January 9th, 2018 at 6:33 pm | Log in to reply. Posted December 14th, 2017 at 2:51 am | Log in to reply. Can I use gochuchang instead of hot pepper flakes? This recipe was originally posted on November 28, 2017 at 7:25 pm by Maangchi. It was last updated on February 24, 2018. The video was watched 373,433 times on YouTube & has 9,813 likes!